The exhibition “Stamos: a communion of abstract expressionism”, is a selection of 22 works, produced between 1967 and 1993 by Theodore Stamos, the greatest and best known Greek-speaking representative of abstract Art. It opens at the Bouzianis Museum, home to Greece’s foremost expressionist painter, George Bouzianis. Barnett-Newman, part of abstraction’s avant-garde, on seeing Stamos’ early works, discerned that he was «an artist sensitive in thought and expression, discreetly brilliant, whose stance on painting, is really close to a real Communion with Nature». Analyzing the above, Stamos’ canvas encapsulates the whole of the universe, with a totemic affinity. Let’s not forget that for 500 years or so in Art history, Nature was but an object of romantic contemplation or a backdrop for the human figure. Stamos instead delves into archetypal structures. He doesn’t paint phenomena emotively but rather as a part of the mystery of life. His paintings could be the merest detail, a tiny orange cube on a red shell or even a black line observed on a white shingle. In this respect, his work functions on the same basis as the first cave paintings at the grottoes of Lascaux: man and his creations exist as one entity in harmony, originating from Mother Earth. The exhibition is based on two series of paintings produced in the artists’ latter period: The Sun Boxes (1963-1970) and the Infinity Fields (1970-1993). It is obvious that both painting series provide a rupture with form. Also, in contrast with the other abstract expressionists, Stamos’ paintings hardly ever exceed the human scale. In the first series, the artist creates rectangular shapes without sharp outlines and chromatic tensions, in dialogue with the void and the absolute. With a child’s gaze, it is as if he is observing light’s playfulness in a range of colors, as if seen from the windows of the universe. In the second series, Stamos, influenced by the cities he travels to and loves, becomes inherently more of an expressionist. He is transmitting an electric chromatic charge to the canvas, as to symbolically absorb, and thus overshadow, the light. With a child’s gaze, it is as if he smudges his emotional intensity, on all the colors of the rainbow. Seen as a jeune premier in the front row of the now infamous photo of ‘’The Irascibles’’ -next to Rothko, Pollock, de Kooning and Baziotes, Stamos is one of the arbiters of change who produced the first truly American movement in Art history. Alongside Kounellis and Samaras, he is Greece’s best known representative abroad. Non-representational, Stamos’ paintings touch on the unconscious, creating bonds of color that connect with the world’s core substance. He invites us all, as the faithful who commune, to the mysteries of Art. 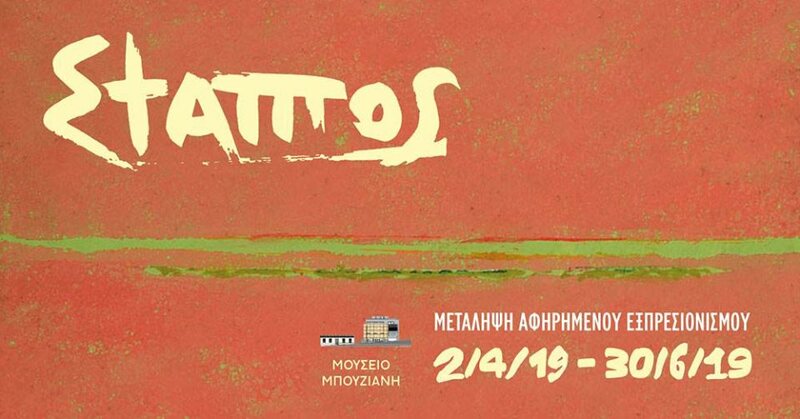 The paintings of the exhibition -presented for the first time in Greece, are part of the collection of Zacharias Portalakis, a collector and personal friend of the artist in the last ten years of Stamos’ life. His decision to have this exhibition at the Bouzianis Museum, gives us all the chance to admire them canvases freely and without fee.